Project Fluminance with The French National Institute for Research in Computer Science and Control (Institut National de Recherche en Informatique et en Automatique (INRIA)). Since 2010, the CSU Chico Atmospheric Lidar Research Group has been collaborating with French scientists Etienne Mémin, Patrick Héas, and Pierre Dérian to apply optical flow algorithms to the REAL images. A first conference publication on the results appeared at the 25th International Laser Radar Conference. Dérian, P., P. Héas, E. Mémin, and S. D. Mayor, 2010: Dense motion estimation from eye-safe aerosol lidar data. p. 377-380 of Vol. 1 of Proceedings of the 25th International Laser Radar Conference. Oral presentation S3O-04 (Thurs. July 8). Mayor, S. D., P. Dérian, P. Héas, and E. Mémin, 2010: Two-component horizontal motion vectors from eye-safe aerosol lidar. 19th Symposium on Boundary Layers and Turbulence, 2-6 August 2010, Keystone, CO. Poster Presentation P1.4. More information on the wavelet-based optical flow, named Typhoon, is available here. 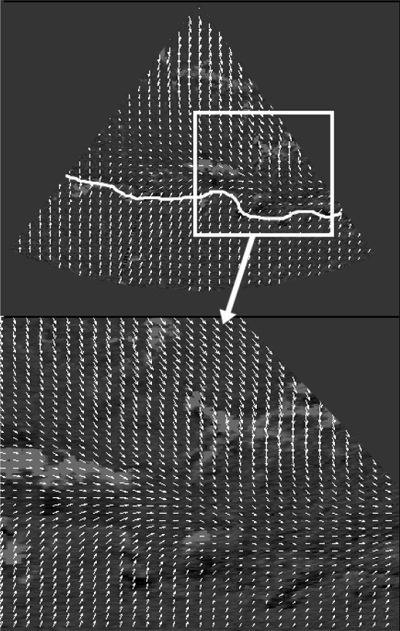 Above: Two-component horizontal vector motion fields produced by a dense motion estimation algorithm were applied to REAL PPI scans collected during CHATS. Initial results of the collaboration are described in Derian et al. (2010).